Who does that voice look like? A few weeks ago, I talked about the American school system and the extremist schools that are going to teach the existence of the Loch Ness Monster, proving the existence of God. At that time I went down the road of supernatural interest and ghost stories. I did, however, mention that in another reality, I might have talked a little about teachers and stereotypes and why the stereotypes exist. That one was all of the realities in one. Very amusing if you’ve seen the episode. If not, belated SPOILERS! I was listening to the Friday Night comedy podcast from BBC Radio. Tim Minchin was interviewing Caitlin Moran, and she sounded very cluey and it was a very amusing interview. And I realised that I had no idea what she looked like. And then I realised that I couldn’t even guess with any real accuracy. My reasoning goes as follows: if you watch a lot of American TV and movies, you start to match voices to faces. Americans love typecasting people. And when you hear someone on the radio in America, there is a good chance that they look how they sound. I know that this is incredibly generalistic (if generalistic is a word) but try it some time. When I listen to British people on the radio, there is no typecasting going on in my head. I can’t picture them. 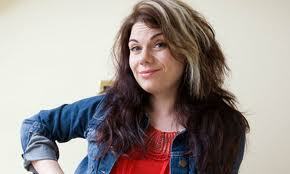 I had no idea what Caitlin Moran looked like. OK, here’s my theory: in America, there are a vast number of people who audition for every acting/media part. Given that excess of talent, producers/casting agents choose people who NOT ONLY can act/sing/talk, but who ALSO fit the concept in their head. A concept that is a stereotype drawn from generations of other casting agents doing the same thing. Types change. New types are added, but in general, they’re a little bit predictable. In the UK, with far less people to draw from, the really talented people don’t necessarily fit a mind model. And this is just me being slightly nice to the Americans. I’d prefer to say that the British are just less shallow and pick people for true talent rather than what they look like. But there’s a chance that the population excess could be true too. Either way, although there are types in British tv, they aren’t as fixed in stone as in America. Who would have thought of Katherine Tate as a companion for the Doctor? I’m currently watching Episodes, with Matt le Blanc (actually, I’m watching Episodes with my wife, but Matt le Blanc is on the show). A British writing team are conned into coming to America to write an American version of their hit British show, about a school headmaster. It’s very funny and pokes a lot of fun at shows like American Coupling, Red Dwarf or Men Behaving Badly. But that’s not my point. It’s funny because we all know that when an American production company gets hold of a British property, they change it so that it fits in with an American audience. They don’t take into account the reason why so many Americans watch the show (making it viable for a remake) is the humour in the British way of thinking about life. And probably the fact that the Brits don’t just hire pretty people and stick glasses on them to make them ugly. – the militant PE teacher. – The Maths teacher in his sandals and socks. – The hippy English teacher who would quote poetry at you and be disappointed when you didn’t burst into tears at the very words entering your head. Or maybe not. Which types of teachers did you encounter over and over? I’m halfway through my teacher blog. Back on track next Wednesday. Oh, and no new Finding Damo – the Novel as yet. But the show was a ripping success.